This year’s Monitoring the Future Survey is encouraging with declining drug use among high school teens; however, concerns remain about the persistent high rates of marijuana and nonmedical prescription drug use. Cigarette smoking continues to fall to the lowest rate in the survey’s history. One-year declines were seen in lifetime use among 8th and 10th graders and all prevalence periods have seen a continued and longer term trend of decreasing cigarette use. For example, five-year trends showed significant drops among all grades. Current use was reported by 4.9% of 8th graders, down from 7.1% in 2007 and from 6.1% last year. Tenth and 12th graders also saw a drop from 2007 to 2012 with 10.8% of 10th graders and 17.1% of 12th graders reporting past month use. Likewise, five-year trends showed significant decreases in alcohol use among all grades and across nearly all prevalence periods. For example, from 2007 to 2012, current use of alcohol declined from 15.9% to 11.0% among 8th graders, from 33.4% to 27.6% among 10th graders and from 44.4% to 41.5% among high school seniors. From 2011 to 2012, decreases were observed in lifetime, past year, current and binge use of alcohol among 8th graders. The use of Ecstasy showed a significant drop in past year use from 2011 to 2012, reported by 1.1% of 8th graders, 3% of 10th graders, and 3.8% of 12th graders. Overall, the use of most illicit drugs has either declined or remained steady from 2011 to 2012. For example, use of inhalants is at its lowest levels in the history of the survey across all grades and prevalence periods. Among 8th graders for whom inhalant use is most prevalent, current use has decreased to 2.7%. Also among 8th graders, declines were reported for current use of amphetamines, cocaine and hallucinogens. Past year use of Salvia decreased from 3.9% to 2.5% among 10th graders and from 5.9% to 4.4% among 12th graders. 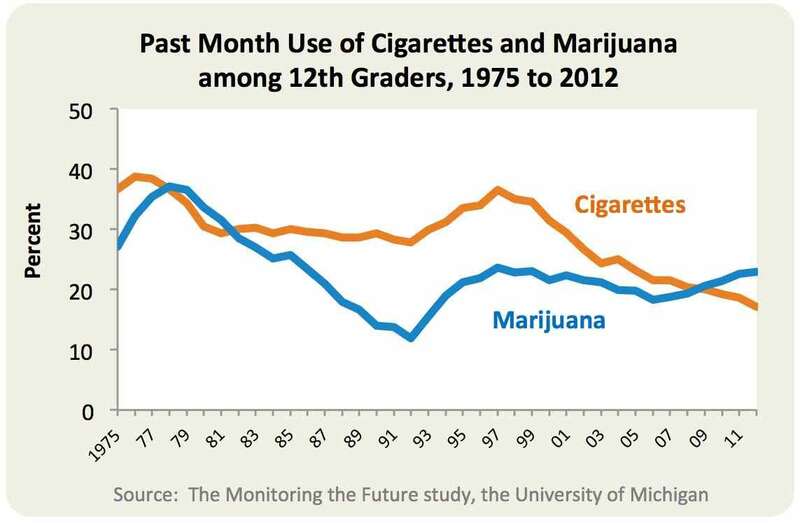 Read the full description of Percentage of U.S. twelfth grade students reporting past month use of cigarettes and marijuana, 1975 to 2012. Five-year trends are showing significant increases in past month (current) marijuana use among 10th and 12th graders and an increase in daily marijuana use across all three grades. From 2007 to 2012, past month use increased from 14.2% to 17.0% among 10th graders and from 18.8% to 22.9% among 12th graders. Among high school seniors it was at its highest point since the late 1990’s. Additionally, these increases continue to parallel softening attitudes for the last several years about the perceived risk of harm associated with marijuana use. This year’s survey captured the use of synthetic marijuana, also known as K2 or “Spice”, among 8th and 10th graders for the first time. Past year use was reported by 4.4% of 8th graders and by 8.8% of 10th graders. About 1 in 9, or 11.3% of high school seniors reported use of synthetic marijuana–unchanged from 2011. Also new in the survey this year was the past year use of bath salts reported by 0.8% of 8th graders, 0.6% of 10th graders, and 1.3% of 12th graders. Many of the drugs used by 12th graders are prescription or over-the-counter medications. Although this year’s survey showed a long term drop in past year nonmedical use of Vicodin among all grades, its use remains at unacceptably high levels (e.g., at 7.5% among high school seniors). The abuse of prescription stimulants is also a cause for concern. In the past several years the percent of 12th graders reporting the nonmedical use of Adderall has increased from 5.4% in 2009 to 7.6% in 2012. As in nearly all cases, attitudes toward substance abuse are often seen as harbingers of change in reported use. 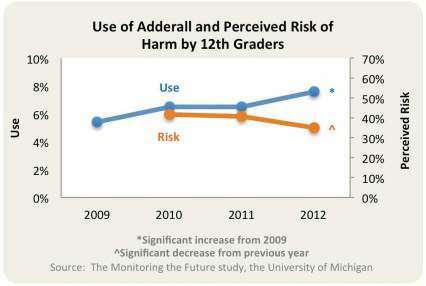 In 2012 nearly 6% fewer high school seniors reported that trying Adderall occasionally was harmful–an indication that use may continue to rise. The survey continues to show that most teens obtain prescription drugs like amphetamines, tranquilizers, or narcotics other than heroin, for free from friends and family; roughly 68% of 12th graders, for example, report getting prescription pain relievers this way. 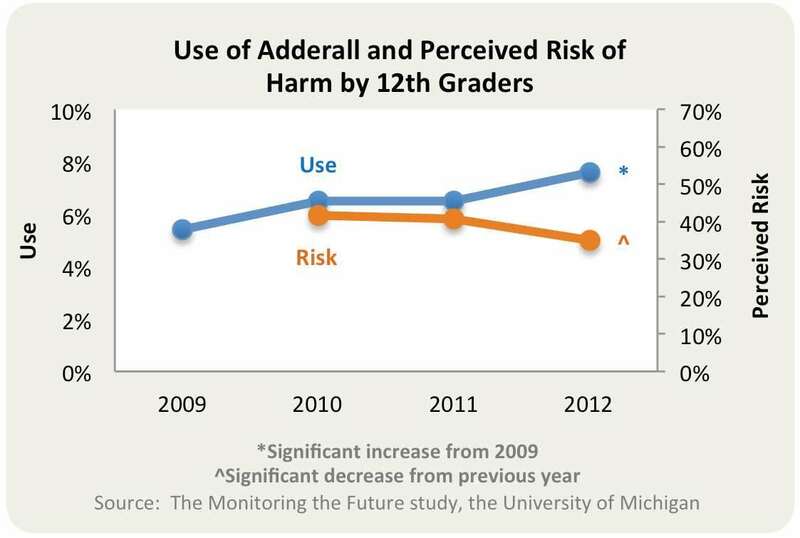 Read the full description of Use of Adderall and Perceived Risk of Harm by 12th graders.